Guantánamo Manual Leak: Has WikiLeaks been censored? 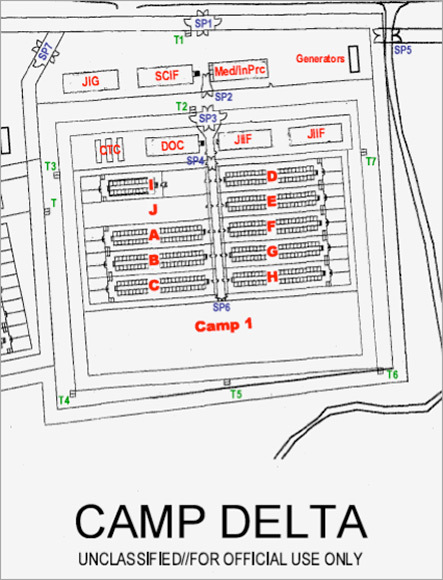 Guantánamo Bay Camp Delta Map from leaked military manual. A never-before-seen military manual detailing the day-to-day operations of the U.S. military’s Guantánamo Bay detention facility has been leaked to the web, affording a rare inside glimpse into the institution where the United States has imprisoned hundreds of suspected terrorists since 2002. WikiLeaks used the software from WikiMedia Foundation for assembling and presenting information and the The Onion Router to provide anonymity to whistleblowers. 1I suppose a Domain Name Server attack might make all the WikiLeaks sites “inaccessible” if, like me, you don’t know any of the IP addresses. If true, a possible countermeasure might be for a number of “above ground” friendlies to post IP addresses to the net – an alternate DNS. Kucinich again: Wherefore Richard B Cheney by such conduct, warrants impeachement and trial, and removal from office. Representative Dennis Kucinich today introduced a “priveleged resolution” H. Res. 7991 to impeach Ricard B. Cheney. It is essentially the same as his previous motion to impeach H. Res. 3332 which was blocked by House Speaker Nancy Pelosi. A privileged motion, if not tabled or referred, must be debated and voted upon. House Majority Leader, Steny Hoyer [D. Maryland] introduced a motion to table, but the Republicans voted it down! The fifteen minute vote lasted an hour and five minutes with many Republicans who had initially voted to table changing their votes. [Brent Budowsky thinks they may have outsmarted themselves.] Eventually some Democrats who had initially voted to table followed suit. The House voted 218-194 on Steny Hoyer’s motion to refer to the Judiciary Committee. The corporate media take the view that this is a campaign stunt that has no chance of further action. The referral to House Judiciary, in their view, amounts to killing it. But polls indicate that 54% of the American people favor impeachment. Many municipalities have passed impeachment resolutions. Needless to say, “alternative media” have a different view. Bradblog has a “waffling” statement from John Conyers. “Waffling” is in his view, better than “not on the table.” Paul Reickhoff, founder of Iraq and Afghanistan Veterans of America, told Rachel Maddow that “this story has legs.” AfterDowningStreet.org, who sponsor ImpeachCheney, view it as a hopeful sign and a cause for action. If you would like to have your name read into the Congressional record, check them out. 1Full text from the Library of Congress. It’s easier to read than the text on Kucinich’s website. Note that resolutions [H. Res.] and bills [H.R.] have separate numbering schemes. 2Full text from the Library of Congress. An easier to read slightly polished version of the full text by Mathew Cardinale of the Atlanta Progressive News. An easy way to compare 333 and 799 is to open them in adjacent tabs and align them vertically. Flipping tabs will cause differences to appear as “motion”. The nomination of Michael Mukasey to replace Torture Alum Alberto Gonzales as Attorney General was voted out of the Senate Judiciary Committee 11-8. It now goes to the full Senate. Harvard Anti-Torture Coalition survives waterboarding! Coalition member demands “Habeas Now!”. University Hall April 26, 2007. When Attorney General nominee Michael Mukasey was asked if he would condemn the use of waterboarding1, he sounded a lot like portly Sargent Schultz in Hogan’s Heroes, “I know nothing, nothing.” The Harvard Anti-Torture Coalition, who did some very fine work busting Torture Alum Alberto Gonzales , reacted, “We Drown in Silence“. But they came up fighting last Friday, urging us to call our Senators to oppose the nomination. They provide phone numbers. There is still time, since the Senate Judiciary Committee vote is tomorrow Nov. 6. Pundits believe that the chances of stopping the nomination in Committee are much better than stopping it on the floor of the full Senate. The Stop Torture front page. John Nichols, who writes for the Nation and the Capitol Times, says that over the weekend U.S. Sen. Russ Feingold launched a new campaign to block approval of the nomination. 2Note the Post-Orwellian locution for “prisoner” and “torture”. 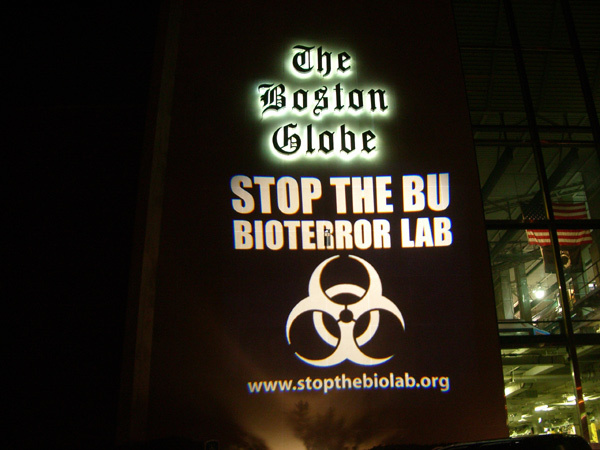 BU “Biodefense” Lab: It ain’t over ’til the community says it’s over. Boulevard, Dorchester, MA [near UMass Mandela and the JFK Library]. Technical augmention is by the StopTheBioLab Coalition. NIH funded study OK’s NIH “Biodefense” Lab siting. It is not quite leaving the fox to watch the hen house. It is asking the fox to outsource the watching of the hen house. The Stop the Biolab Coalition has cases before both the State and Federal Courts. The case with the State was heard by the Supreme Judicial Court on September 5. BU asked for a continuance in the Federal case. NIH Community hearing Thursday Sept 20, 2007 Faneuil Hall.